The Free Lottery Pool (freelotterypool.com) offers players a system that is more lenient when compared to other lottery platforms: Free Lottery Pool, the lottery tickets for the pool are purchased with advertising revenue generated from website traffic. All members who are registered in the pool share the same free tickets that were all paid for with website advertising revenue. With more players enrolling, the size of the Free Lottery Pool can grow into the thousands of participants, cash payouts only occur for Jackpot wins (6 matches out of 6 numbers). 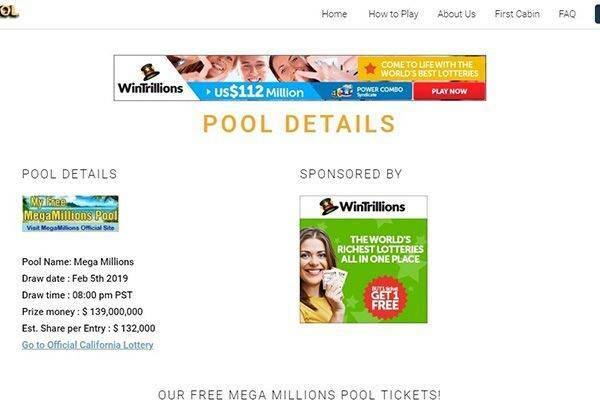 Free Lottery Pool operates s strict system, players are advised to follow their rules strictly to ensure they get their winning, only players 18 years and older are eligible and players who provide inconsistent information would forfeit winnings. By 2016 Free Lottery Pool played on over 3,000 Powerball, Megamillions & SuperLotto Tickets worth over $4,000, paying for all those tickets with advertising generated revenue. Tickets details are usually posted on the website before the draws take place ensuring a 100% transparency. Free Lottery Pool publishes a recap summary at the end of every month detailing information about ticket purchases and cost and total teaser winnings. Game-play options provided by Free Lotto Pool takes the form of syndicates (this is a key point and the essence of their website). What is also remarkable, the agent purchases real lottery tickets, but not merely provides a betting platform. Each player that makes use of the Free Lottery Pool platform is required to create just one account, providing accurate information. Players can only register using either a Gmail or Yahoo email address that would be verified in the course of the registration process. All tickets are paid in full by Free Lottery Pool advertisers. Free Lottery Pool makes no commitment to provide players with scanned copies of their lottery tickets. The Free Lottery Pool makes available no mobile application for players, all bettings are done directly on their website. There are several bonuses mentioned on the Free Lottery Pool website, however, they fail to give further information regarding each one. Some of them include the ‘invite a friend’, the Lucky Reward Points, Loyalty Pool Points, the Fortune Cookies bonus. Registration bonuses are given to players following registration which could be as low as getting Lucky Reward Points or as much as receiving the First Cabin Membership. Considering that the main idea of the Free Lottery Pool is that lottery tickets are free, they do not require players to make any initial deposits before they get access to play the lottery. Free Lottery Pool buys all lottery tickets (Powerball, Megamillions, and SuperLotto) and they get the money to do so via Google Advertising revenue, generated by the website traffic. Free Lottery Pool requires 10% of “net” Jackpot winnings as charge fee. There is no minimum limit, all winnings can be cashed out by players as they so wish. 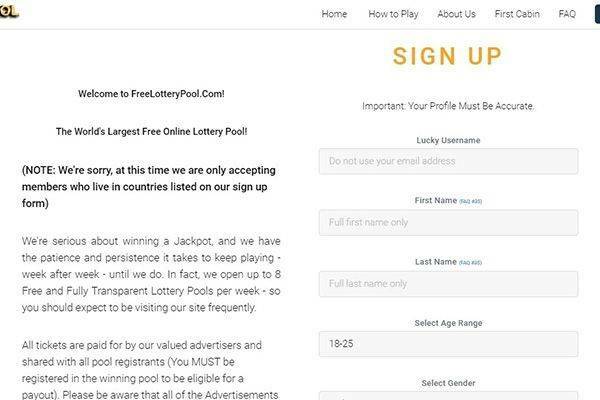 Players on Free Lottery Pool are notified through emails when they win, this could be convenient as we doubt there are many winners from this platform. FREELOTTERYPOOL has an FAQ page explaining the operation and answers several questions related to user’s information security. While FAQ seems relevant if customer support is needed, reaching it isn’t instant. There’s a contact form and direct email address published, but no word on availability of CS and response time. Is Free Lottery Pool legit or fraud? 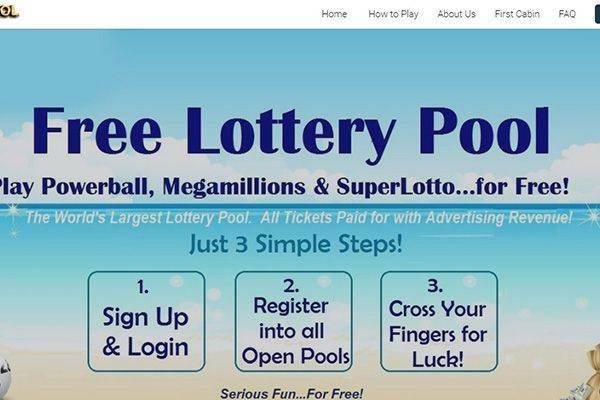 Free Lottery Pool provides no information regarding its corporate ownership and legal name nor any information about its registration status or whether or not it is licensed, the agent claims that the website is undergoing construction. Free Lottery Pool does get an Alexa ranking of 430,050. 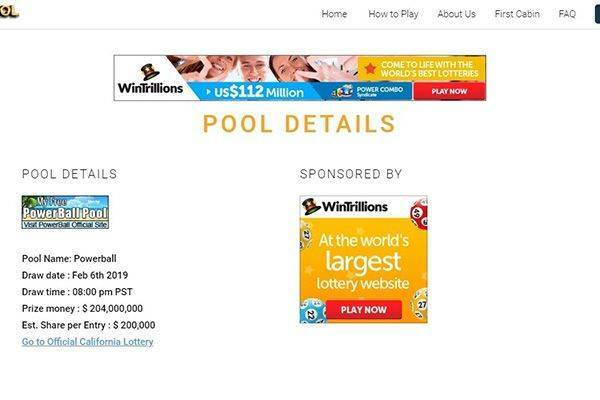 Free Lottery Pool website is secured by Google Safebrowsing. They assure players that their private information is safe and would not be shared with third-parties. Free Lottery Pool is as good as it gets for a free lottery platform, players should expect a lot of advertisements and even spam emails in exchange for the free services. Alexa ratings are good and they seem to have a working system, players might not win much but they wouldn’t lose anything either, also the charges are fair enough for whatever winnings they are able to make happen for players.